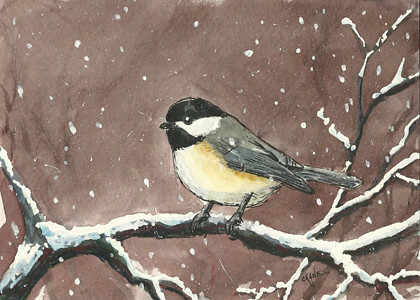 Dariana’s Chickadee watercolor – Let's Paint Nature! I painted this for my friend’s step-daughter. She is visiting from Costa Rica. This is her first time in America. 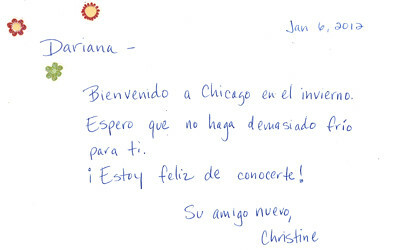 So what does a girl from Costa Rica need from Chicago? Unfortunately as it turns out, this is the mildest winter Chicago has had in a very long time. Mild and dry. Right now it is 53°F, downright hot for a January day in Chicago! Maybe my Spanish speaking friends out there can tell me if I did okay? Very nice! It looks like your spanish is just fine..good job! Thanks Roberta! I cheated, so I wasn’t sure it was correct. Beautiful painting! You are a wonderful friend! Love and hugs! Great job on the Chickadee!